Let's talk a bit about folktronica. The genre term was originally coined in the very early 2000s to describe a new genre fusion between traditionally organic folk music and electronica, typically driven by sampling of that instrumentation. And at first glimpse, it was a fusion that made no sense to me: folk was typically a richly organic genre defined by singer-songwriters and intricate lyrics, while lyrics tend to be the last thing that's relevant in most electronic music, especially the material intended for dance. And yet, over the past year with the success of Avicii's debut album TRUE, folktronica began inching into the mainstream, driven partially by the small folk resurgence in 2012 and the continued acceptance of EDM on the mainstream charts. Now I was really hard on Avicii's TRUE, and I reckon that while I don't think the album works all the way, it has grown on me a bit for some reasonably decent songwriting, shockingly solid organic elements, and great melodic composition. My issue with that album always came back to the fact that the electronica elements felt underweight in comparison with the richer folk sounds, but it was a sign that perhaps the genre fusion could work, and thus I resolved to keep my eyes open for any possibilities this might crop up in the future. Enter Hundred Waters, a newer indie band from Florida who achieved some measure of critical acclaim with their self-titled debut album that critics were branding folktronica. And it was a very different animal than Avicii - or indeed from Skrillex, who signed them to his vanity label in 2012 - instead taking more cues from quieter, more understated electonica in the vein of James Blake. Hundred Waters opted for fluttering hollow synths against tightly composed guitar lines, every piece coming together to create beautifully organic compositions. Now I wouldn't say that self-titled debut was perfect - I was unsure how much I liked the very breathy vocals from Nicole Miglis, and the songwriting had moments that came across as a little too precious and cute for my personal tastes - but there was talent here and while I wished the folk elements were played up a little more in the compositions, I was interested in their sophomore record The Moon Rang Like A Bell. So how did that go? Well... do you ever have those records you can admire very much for their construction and what they're trying to do without really liking them? Well, that's where The Moon Rang Like A Bell by Hundred Waters falls for me - a record that I'm quite certain is good and my higher brain functions appreciate, but does very little if anything for me on a more emotional level. It's dark, it's moody, it's well-composed, the lyrics capture some complicated emotions quite well... but at the same time, it's not a record that resonates with me. And if this means this review is a little scattershot, it's because I'm going to try to use it to figure why this album doesn't quite work, at least for me. So let's start with the instrumentation, which, right of the gate, move in the opposite direction of which I was hoping. Instead of emphasizing the folk elements, they're nearly gone, replaced with thicker, more spacious electronics that lean more towards dreary, saturated soundscapes drowned in reverb. Now I've stated in the past I'm no big fan of smothering songs in reverb, and when the keyboard melodies are as good as they are, it's a little frustrating to hear them feel as murky and occasionally lo-fi as they are. In fact, all of the organic instrumentation feels swallowed up and muted, with only brittle electronics and some occasional thicker drum machines feeling more prominent in the mix. And there are definitely moments where this works: I like the eeriness of 'Cavity' in the ominous tones, the jittery piano riffs on 'Out Alee' and 'XTalk', the windy haze of 'Innocent', and the great contrast between the punchy bass drum and drill-like high synth that builds to a pretty effective crescendo on '[Animal]'. And it all feels as well-constructed as their self-titled release - but at the same time, it's a little less impressive this time around because the tight guitar work is almost entirely absent. And I have to admit, the unearthliness of some of the presentation doesn't exactly make the album have a real emotional punch, at least for me. And I don't think the vocals help either. I wasn't the biggest fan of Nicole Miglis' voice, as it always felt a little thin and breathy to me, but it was effective at conveying richer emotions via a more folk presentation. But with the additional of reverb and autotune and thicker multi-tracking, I feel even less of a connection to her admittedly pretty vocals than before. What's more exasperating is that I routinely had to dig up the lyrics because the production doesn't exactly make them all that comprehensible the first or even fifth time around. Once again, very pretty and her voice fits in naturally with the composition, but I feel some of that human connection is lost. Her voice and presentation reminds me a lot of Bjork, another act I have a hard time really connecting with because of the vocals. Because here's the other thing: with an act like Lykke Li, I get that emotional connection through her delivery and very similar production, but it doesn't quite work as well here. And here's the frustrating thing: I get the feeling that this delivery and production were intentionally muted and stifled, because it directly ties into the lyrics and themes of the record. Miglis has gone on record saying she wanted more attention to be brought to the lyrics - which, like most Hundred Waters lyrics, are scattershot and a little hard to decode until the larger context clicks into place. Which can take a number of listens - and fair warning here, with the languid intermediate section of this record, can feel very long. But again, I feel that was part of the point with the album's theme, which really turns out to be quite simple: this is an album exploring unspoken frustrations in a relationship, particularly from a woman's context. It's where she's straining and building up courage to speak out and potentially damn herself in the process, but faces her own deeply held insecurities and fears along the way. And to give serious credit to the songwriting, it's actually surprisingly nuanced. Songs like 'Cavity' and 'Out Alee' capture that dreaded feeling of panic and fear that comes with the realization something in the relationship has gone awry, and songs like 'Broken Blue' and 'Down From The Rafters' shows her trying to put on a happy face and fight against her instincts. And then there's songs like '[Animal]' and 'Innocent' where she questions whether or not the problems is hers, or even succumbs to her own self-destructive drive and tries to exist on his more base level. And the double punch of the ending is especially satisfying, because she finally tries to confront the issues on 'XTalk' and doesn't really resolve things, as the guy walks out and leaves her lonely on the final song 'No Sound'. It ends on a really downbeat note, but it's a bitter catharsis that at least feels earned. And on that note, the production kind of fits - the moody bleakness, the dreary, stifled nature of the production, it fits the tone. And thus, it's kind of a perfect counterpoint to the most recent Black Keys album Turn Blue, and by well-framing the female perspective arguably turns out a little better for it. But that said, it suffers the same basic problem that record does, because there's bitterness and sarcasm and a sick feeling of dread and frustration that leaks through on this record that's not exactly pleasant - and while it feels more realistically framed, the choice to make everything more muted and tasteful takes away from some of the visceral power of Lykke Li's most recent break-up record, or from 'Mama's Broken Heart' by Miranda Lambert, which attacked similar themes and dug deeper into the underlying anger of it all. This album is more reserved than that, and in my opinion doesn't quite connect with me in the same way. 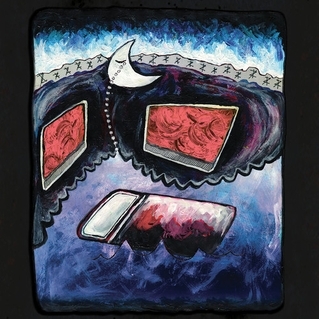 That said, I do recommend The Moon Rang Like A Bell by Hundred Waters, and it gets a very solid 7/10 from me. But keep in mind most of my issues comes with the creative direction of this album - I kind of wish Hundred Waters had stuck with more of a folk sound, and if you're more of a fan of electronica or Nicole Miglis' vocals, you'll probably like this album a lot more than me. As it is, it's a fine indie release, one of the few I think uses reverb well, and is definitely worth your time, so check it out.